Fred Destin is a partner at Atlas Venture. There’s a little strategy game that both entrepreneurs and venture capitalists excel at. It’s called re-segmenting markets. It’s as old as marketing itself and it’s very useful when you’re trying to define white space for your market. So cloud has now morphed into a series of acronyms that somehow all manage to incorporate “as a service”. Behind all the hard work in seducing analysts into designing ever more precise magic quadrants, there is a movement at work in which the cloud is spawning the second wave of startups. Central to this new wave are dynamically configured – or “runtime” – services like Heroku that don’t require hardware provisioning and services that combat IT “lock-in” by making data portable. Both runtime and portability services not only need to provide value, but also must hide complexity from the user. Let’s focus on the Platform as a Service (PaaS) segment for a moment. If you think Debian is an electronica band you might not relate, yet companies like Heroku and Engine Yard have slowly been building the infrastructure and range of scripting languages that web developers have been dreaming about. Unsurprisingly, they’ve also attracted the watchful eyes of acquirers (with Salesforce buying Heroku a couple of years ago) and incumbents (with SAP, RedHat, Oracle and VMWare all entering the space with slideware and, occasionally, product). Now we’re all waiting to see how the game plays out and, in particular, what moves the big boys – Google with App Engine and Microsoft with Azure – make. For those who think the real disruption is in mobile, PaaS isn’t where the puck is going. PaaS offerings were designed and built for a web-centric world, where customers build and host a backend and a web tier on the PaaS technology stack. Mobile apps, however, live across native and HTML5 platforms that require libraries that connect to the backend. PaaS doesn’t make this easy. Developers have to figure out how to connect cross-platform PaaS in a secure manner to their backend, while ensuring that the apps work online and offline, while synching data with the backend and various other third-party services. So mobile brings an explosion in complexity. The services are now in dire need of smart “context awareness” (that’s a fancy way to see that you don’t do the same stuff on your mobile as you do on your big screen) and developers are dying to provide consistent experiences across devices. Right now all we hear are stories of dev teams backing away from Android simply because they cannot deal with the platform complexity. It’s a nightmare for everyone. Who wants to bet their business on a single-platform, iOS-only launch? Enter Backend as a Service (BaaS) – a simple runtime environment that spins up all the backend connectivity developers need, allowing them to focus on the user experience, not the app’s “plumbing.” BaaS provides mobile developers with the entire backend stack, including native mobile and web libraries, which ensure the app keeps the data secure and works online and offline. As a result, developers have a consistent user experience across all devices. Check out the infographic above (or click here for a larger BaaS infographic) to see where it fits in this increasingly complex cloud ecosystem. Back to my opening point: Who needs JASA (Just Another Stupid Acronym)? Well, you may want to pay attention as the second wave of cloud services picks up where the first one left us. IT infrastructure is a total mess, and with the emergence real-time analytics and big data it’s getting messier still. We’re looking at a second wave of companies that are runtime by nature and facilitate (rather than impede) data portability all while shielding the user from technical complexity. The VC industry has certainly paid attention. And since everyone knows we never create anything remotely interesting without entrepreneurs, that means the smart entrepreneurs took a liking to this trend a few years ago. VCs are refreshingly dumb because experience has taught all of us that it’s no good being too smart. So we look at massive macro trends (Ten billion devices! One billion mobile apps! ), hard customer requirements (speed to market, code quality and security, cost efficiency) and attractive platform opportunities. There are in the region of 25 companies active in the BaaS space today. I backed the guys who coined the term “Backend as the Service,” Kinvey, out of TechStars. Kinvey recently raised a $5 million Series A from Avalon Ventures (the team who backed Zynga) and from my firm, Atlas Venture. Parse and StackMob are two other leaders in the BaaS field, and there are rumors that Ray Ozzie is working on a BaaS startup too. 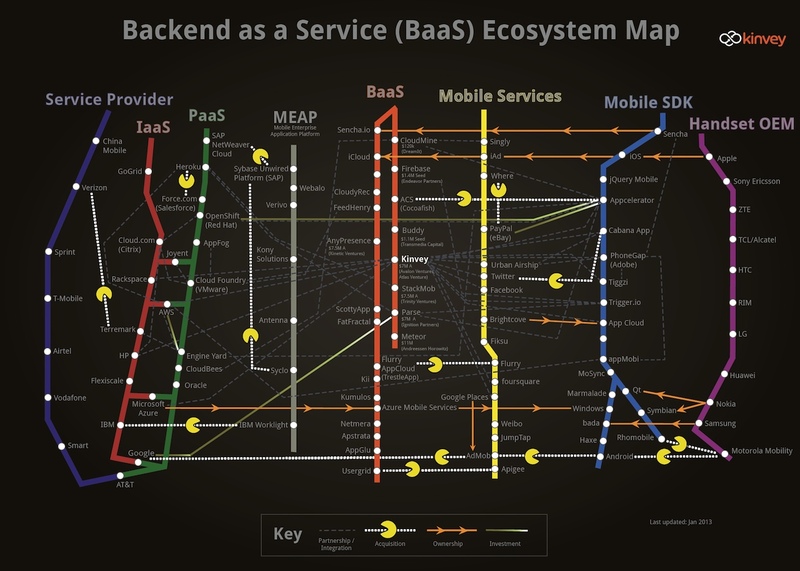 Michael Facemire at Forrester has written a good overview of the BaaS market, which is a great place to start if you want to learn more. Money is flowing in for a simple reason. If Salesforce is the hub for CRM and LinkedIn is the economic graph, then the company that becomes the data hub for the world of apps will be very, very valuable. We’ve got their backend, so they can have yours. Fred Destin is a very early stage investor who loves what he does. You can follow on him on Twitter @fdestin or learn just about nothing about his firm on its website www.atlasventure.com. He invested in Kinvey.